Happy Fun Friday, SHINE girls! I have another HUGE surprise for you! Can you stand it?? This month--our SHINE November to Remember-- I will be featuring several SHINE girls and their stories of how they serve others. These girls are truly inspiring and I hope that you will be spurred on and encouraged by them as well. SHINE girls are on a serving mission this month, and I want us ALL to be a part of it! Today's post is from Mary Kay Jackson. I have never met Mary Kay, and in fact, have only emailed with her a few times. Let me just tell you what a God story this is, though. Mary Kay is a friend of a friend of mine, Jamie Miles. Jamie had shared SHINE girls with Mary Kay and we met through Twitter. (of all places!) Jamie tried to arrange a lunch date for the three of us, but it never panned out. Shoot. Long story short, I found out that Mary Kay is a missionary, and I went to her website to read more of her story. After many tears, I contacted her weeks ago to share her story on SHINE. She agreed, thankfully. Little did she--nor I--know, that our reading this month would be in Matthew. The gospel of Matthew is the very thing that spurred Mary Kay on to her mission work. Wow! The timing could ONLY be Holy Spirit ordained. Okay, I will shut-up and let her speak. Be blessed, sweet girls. I cannot think of another way to start our Fun Friday! Wow, I am so honored to get to share a part of my story with you SHINE girls. You all have been such a blessing to me over the past several months, as I have followed along and read with you. I can’t tell you how many times the blog post for the day has been spot on about something I am dealing with. Isn’t God amazing that way? He will get His message through to us in whatever way He can, even a blogpost from 5700 miles away. Once upon a time, a long, long, time ago (well it feels that way), in a land far, far away (remember that 5700 miles? ), there lived an ordinary family, living an ordinary life in suburban Atlanta. There were Dad, Mom, two boys, one dog, boy scouts, soccer practice, etc. etc. You know this story – a lot of you are living it, or have lived it, or want to live it. It wasn’t a fairy tale – it was our real life. But then God got involved. Now, my husband, Charlie, and I both grew up in church. We had decided early in our marriage that our faith was important and we to be intentional about following Jesus in our lives. I guess we thought this meant raising our boys to love Jesus, being involved in the church, leading Bible studies, and the like. Charlie worked in business analytics with UPS, and I worked as a consulting civil engineer, designing municipal water and wastewater systems for clients like Gwinnett County and the City of Atlanta. Little did we know what God had in store for us. I remember when I used to read our passage for today, Matthew 25. Sisters, I am embarrassed to admit how I used to react to Jesus’ story about separating the sheep from the goats. I don’t know if it was pride, or spiritual immaturity, or what, but I used to read the part about “when I was thirsty, you gave me something to drink”, and think “I do that – I give people in metro Atlanta safe water to drink”. I wanted it to be like a checklist – yep, got that covered. I guess that makes me one of the goats, huh? Or at least, not a very humble sheep. Then, in 2001, I read the passage again. This time, as I was getting ready to check off my list again, “yep, still doin’ the water thing”, God pulled me up short and opened my eyes. He clearly pointed out to me that I was not reading the entire passage, at least not closely. He pointed out verse 40, as if it had a spotlight on it. The least of these? God pointed out to me that no one in metro Atlanta, or the southeastern United States, where my projects had all been located was dying of waterborne disease. Yet, according to the World Health Organization, 3.4 million people die each year from water-related diseases, the number one killer around the world. And UNICEF reports that 4000 children die each day from drinking unsafe water. God’s children were dying in Africa, in Asia, and in South America. These were “the least of these”, at least by the standards by which I believe I will be judged based on my skills and training. Ladies, I DID NOT see this as a “Fun Friday” challenge. I didn’t really know what I was supposed to do about all this. I started praying, “Lord, show me what you want me to do,” but I’m not sure I really wanted the answer. About this same time, as Charlie and I were leading a Bible study lesson on discerning God’s call on your life, one of the group members said, “Well, it’s not like God is calling any of us here to be missionaries in Africa!” Charlie and I just looked at each other and somehow, we knew. Yes, He was calling two of us in that group. 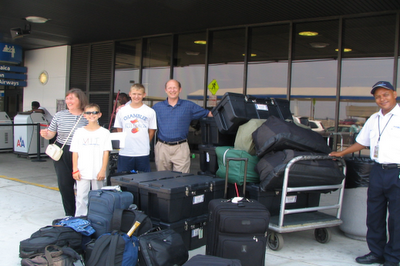 In 2002, our family traveled to Ghana to visit friends who were missionaries there. 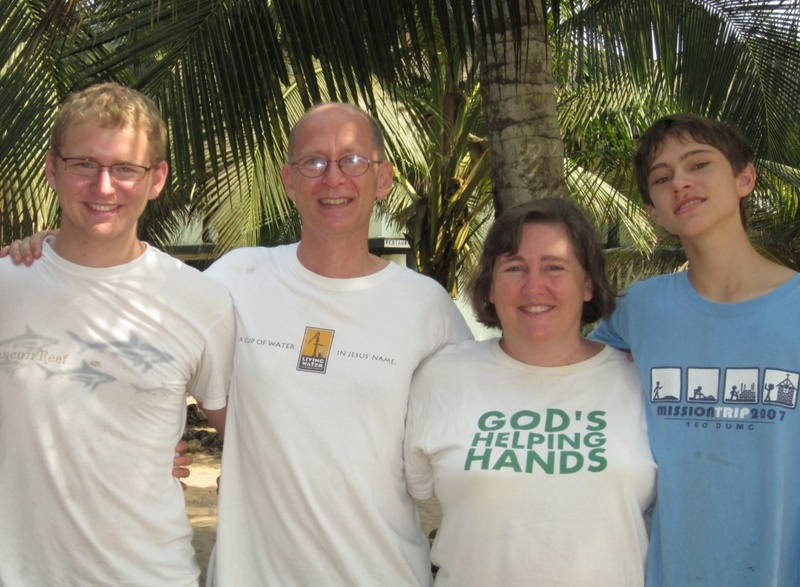 We thought that this family mission trip would be a good way to see a part of the world we would never otherwise see and to show the boys, ages 8 and 11 at the time, that not everyone lives a suburban Atlanta lifestyle. At the end of our two weeks in Ghana, we had fallen in love with her warm, friendly people and her beauty. 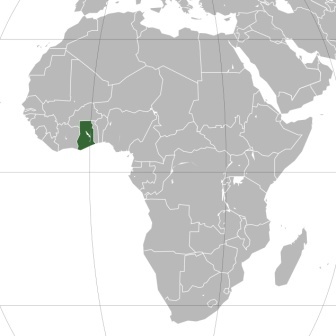 Ghana is a country in West Africa. It is known for its production of gold and cocoa. Fortunately, it is a former British colony, so the national language is English! Charlie and I started talking about becoming missionaries “someday”, thinking of early retirement once the boys were grown. Then the boys started asking questions like “When are we going back to Africa?” and “We saw villages that didn’t have clean water. They could only drink from the river. Can’t you change that, Mommy?”. And we knew. We knew that the call was for now, and for the whole family, not for some day. In August of 2006, on our 20th wedding anniversary, with all our possessions either in storage or packed in 18 trunks and suitcases, the four of us got on a plane and moved to Ghana. Here we are, standing in front of Atlanta’s Hartsfield-Jackson International Airport, getting ready to move to Ghana. L to R: Mary Kay, Ken (12), Chip (15), Charlie, and our sweet, but overwhelmed Sky Cap. The last 6 years have been an amazing adventure. Chip and Ken were 15 and 12, when we moved – now they have both graduated from high school in Ghana and in college in the US. Charlie has found a new calling and career as a professor, teaching college level math and computer science courses. Here we are in January 2012. Chip is now 21 and a senior at Virginia Tech; Ken is 18 and a freshman at The Rose-Hulman Institute of Technology, in Terre Haute, IN. And me? Well, I am still working on being a sheep. But now, I know I am getting at least the water part of the story right. Because I work daily to bring clean, safe drinking water to those who don’t have it – “the least of these”. In the last 6 years, I have helped provide wells and other needed water projects in twenty different locations around Ghana. An organization I manage has distributed over 15,000 household water filters so that families can make their water safe to drink. And hopefully, some children who would have died of waterborne disease will now live. 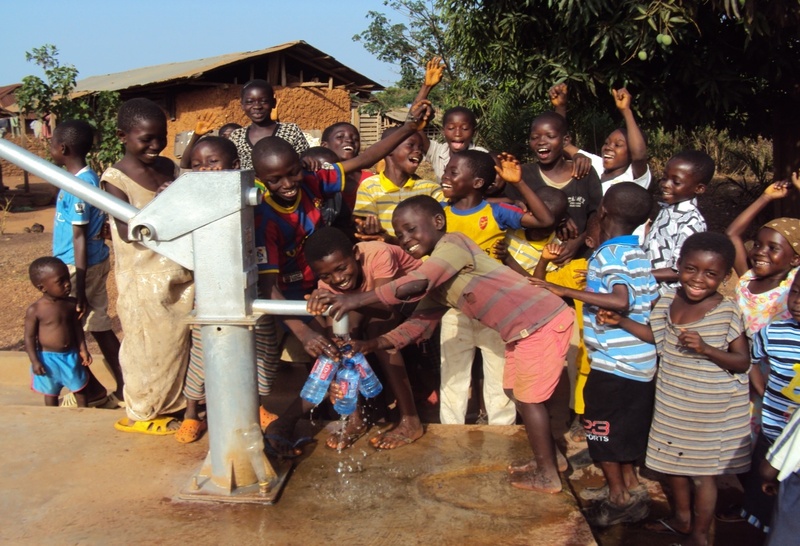 The children of Koduakrom, Ghana, are no longer the “least of these”, as they celebrate their new water supply. So the Fun Friday Challenge for this week? What are you doing for the “least of these” around you? We are not all called to go off to Africa as missionaries (though if someone out there is, email me!). But we are all called to be a blessing to those that are hurting around us. So this week, take action. Take time to serve a meal in a soup kitchen, or visit someone in prison (or housebound). Invite a stranger (maybe the new neighbor, or an international student at a nearby college) over for a meal and fellowship. Take your old winter coat to a homeless shelter. There are lots of ways to reach out to the “least of these”, and you will have reached out to Jesus when you do. And of course, Jill and I can’t wait to hear about it, so tell us what you do by posting a comment here. Always remember to SHINE for Him, dear Sisters!